On Tuesday evening 8 members of the Martin Maslins team attended a Charity Quiz Night hosted by Forrester Boyd at Grimsby Golf Club. 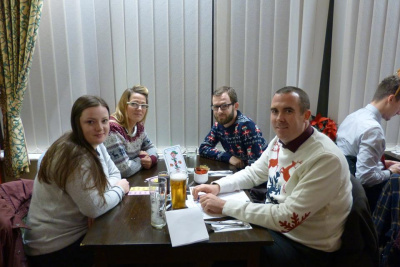 The quiz was entirely based on Christmas with 6 rounds of festive fun including Picture Round, General Knowledge, Music, Film & Television, Food & Drink and a Christmas Cracker joke round! To add to the Christmassy feel all attendees were asked to wear something related to Christmas - so the jumpers were out in force. We split ourselves into two teams, The Ghost of Maslins past for the more, shall we say experienced, members of staff and The Ghost of Maslins Future for the younger generation (I don't often get classed as that anymore). Neither team were amongst the prizes for the quiz, the eventual winners scoring a credible 120 points. Office bragging rights went to Maslins Future with a score of 102, narrowily beating Maslins Past who scored 96 much to the dismay of Senior Partner John Hudson. John earmarked the 'Joke' round for hs teams failure and is still insistant that the answer of Stick should be attributed to the question...What do you call a Boomerang that doesn't come back? and not What is Brown and Sticky? But it is all for a very good cause and on the evening When you Wish upon a Star benefitted to the tune of £1100. Thanks must also go to Grimsby Golf Club as the catering was divine. I had the Rudolph Burger which was an incredibly tasty Venison Burger with the best homemade chips I have had in a long time. The other option was Christmas Pie which contained Turkey, Ham and Bacon.